From right to left: Saba Vasefi, Filmmaker & Asylum Seekers Centre Ambassador; Senator Scott Ludlum; Kween G, Hip hop artist; Minerva Khodabande, Sydney Youth Orchestra Cellist; Dr Graham Thom, Amnesty International Refugee Coordinator;Hani Abdile & Michelle Cahill, poet; President of Refugee Council of Australia Phil Glendenning; Prof.Sahar Amer, Chair of Department of Arabic Language and Cultures, The University of Sydney; Prof. Stuart Rees, CEO of Sydney Peace Foundation;Prof. Wendy Bacon: Academic and Investigative Journalist University of Technology. 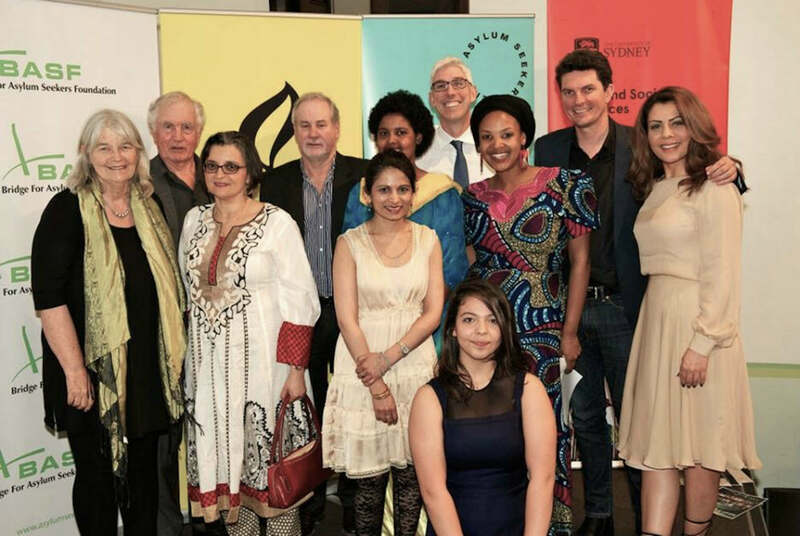 This sold-out event featured influential and distinguished Australian human rights advocates from the fields of politics, art, academia, literature and media, as well as outstanding patrons and executives from various refugee and asylum seeker organisations. 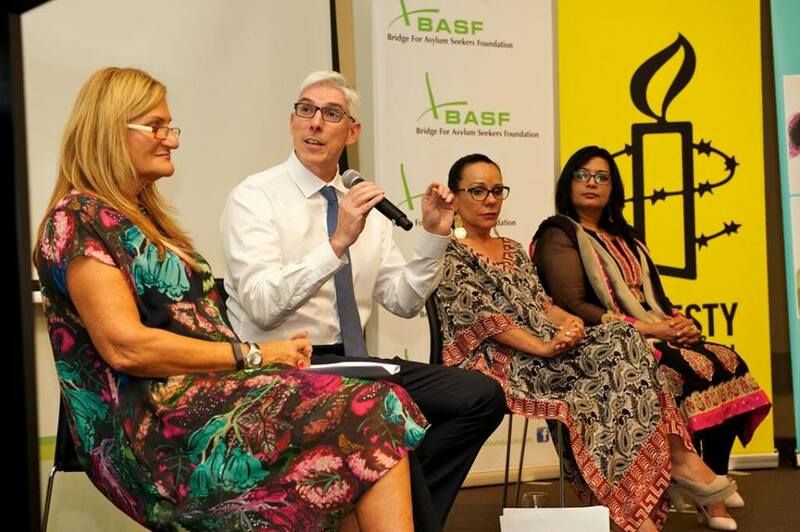 The event was hosted by the Bridge for Asylum Seekers Foundation and supported by the City of Sydney Council, Amnesty International, Asylum Seekers Centre and Refugee Council of Australia. All proceeds were donated to the Bridge for Asylum Seekers Foundation, and twenty free seats were reserved so that refugees and asylum seekers could attend. The event was promoted in three languages: Farsi, Arabic and English. Saba Vasefi, Asylum Seekers Centre Ambassador, feminist filmmaker, academic and poet , was the director and mastermind behind the symposium. The evening was launched by Senator Scott Ludlam, Deputy Leader of the Australian Greens, and MCed by Van Badham, writer and Guardian Australia columnist. The Symposium showcased speeches by Prof. Wendy Bacon, academic and head of the Journalism Program at The University of Technology; Phil Glendenning, President of Refugee Council of Australia; Frances Milne, Committee Member of Bridge for Asylum Seekers Foundation and Balmain Uniting Church; Prof. Stuart Rees, Director of Sydney Peace Foundation; and Prof. Sahar Amer, Chair of Department of Arabic Language and Cultures, The University of Sydney. The event also included performances by Sydney Youth Orchestra cellist Minerva Khodabande, poets Hani Abdile and Michelle Cahill, and hip-hop artist Kween G Kibone. Vasefi’s poetic and metaphoric short film Symphony of Strange Waters was also screened. If Bennelong, having seen the destruction of his own peoples and culture by these new arrivals, could extend his hand in friendship, how can we in modern Australia possibly fail to do the same for those who seek refuge today… This acknowledgement [of country] also reminds us that this nation, over 200 years ago, provided a home to the disenfranchised of Europe, a reminder that we have a duty to do all we can for the dispossessed of the world, not only because it is fundamentally our moral responsibility, but because it is built into our national identity. Discussion about refugees in Australia has for too long been silencing the voices of the people most impacted. At other times it is reduced to a cold debate about numbers and statistics… What better way to correct this than an inspiring collection of performances and stories from people who came to Australia seeking a better life? I’m constantly advised that dominant hierarchical power structures won’t allow marginalised groups to impact policies. However, many examples from my previous experiences as an advocate prove otherwise. Iranian campaigners against the death penalty did not change the fundamentalist regime in Iran and they could not revoke the death penalty. But surveys prove that in one year about 350 families forgave the convicted instead of taking revenge. This shows that political elites and others in positions of privilege can be challenged and positively influenced by the attitudes of civil society. This is one of the reasons which motivate me to organise cultural and artistic activities as an alternative form of civil resistance. What we know in Australia is that racism and xenophobia increase where communities are experiencing economic anxiety. If people are trying to understand why sections of the Australian populace are actively hostile towards refugees and drawn towards radical nationalist movements like Reclaim Australia, consider what constitutes reality for these people: 40% of Australians are now in insecure work, wages are not keeping pace with productivity, inequality is rising, welfare is retracting and the housing bubble is precluding generations of Australians from the economic security of home ownership. In confusing times, people gravitate towards extreme, simplistic and irrational propositions, and racist scape-goating is one of them. So if we are serious about shifting public opinion towards refugees, we must address the context of the hostile opinions, and be prepared to engage the complex, intersectional reality of economic circumstances and political behaviour in order to make change. The demand must always be for economic equality so that social equality can be made possible. Bridge for Asylum Seekers Foundation is thrilled to be able to host this evening which brings together so many people from diverse backgrounds, including politicians, activists, humanitarians, academics, artists and many others, all of whom have a common interest and focus on the needs and rights of asylum seekers both in Australia and elsewhere, and a passion for working towards redressing the injustices which they suffer from at the present time both in Australia and elsewhere. One of the panel discussions. From Right to left: Dr. Mehreen Faruqi, Member of NSW Parliament; Hon. Linda Burney,Deputy Leader of the Opposition, Shadow Minister for Aboriginal Affairs,Dr Graham Thom:Amnesty International National Refugee Coordinator,Violet Roumeliotis, CEO Settlement Service International. Other prominent leaders from various fields also contributed their ideas on these important and relevant subjects. Prof. Bacon highlighted the vulnerable situation of detained women and the importance of speaking up against violence towards them, saying ‘We must not tolerate the appalling emotional and physical abuse that Abyan and other women have experienced on Nauru while under control of the Australian government’. Prof. Rees encourage awareness about the criminalization of seeking asylum by bringing attention to Australia’s preoccupation with military solutions, pointing out that ‘The massive movement of refugees around the world is called a crisis but looks like a permanent problem… Australia’s Operation Sovereign Borders is preoccupied with military solutions which perceive asylum seeking not as a right but as a threat to security’. ‘Australia must end mandatory detention and the ongoing suffering of women under these inhumane systems. Not only do women bear the brunt of war but when they flee they are locked up and are exposed to mental trauma and sexual abuse in offshore mandatory detention centres. Violence against women is a crime’. Stories like those of former asylum seeker Michael Ascharsobi, who was held on Christmas Island as a teenager, show how successfully people can integrate and have a positive influence on Australian society. Michael came from Iran and had never used a computer or heard of the internet, but after being released from immigration detention he saved up and pursued education. He now works for Google Australia and is a lecturer at the University of Technology Sydney. Dr. Thom contextualised these observations by declaring, ‘While celebrating Australia’s commitment to resettle an additional 12,000 Syrian refugees, as a developed country Australia also has the capacity to process those coming here seeking asylum and needs to show leadership in treating those that come here seeking asylum with the same amount of dignity and respect’. All in all, The Refugee Rights Symposium successfully celebrated differences as well as common interests, highlighted the power of art and literature to unite us, and helped educate the audience on the refugee experience as well as shed light on the plight of women of colour in leadership positions. Diane Busuttil is a physical performer who trained as a dancer at the University of Western Sydney, Australia from 1992 to 1994, where she majored in dance on film. She has since danced, choreographed and taught her way all over the world performing and collaborating with a diverse range of artistic groups in the capacity of dancer, acrobat, teacher, choreographer, producer and director. This entry was posted in Diane Busuttil, Issue 17, The Refugee and Asylum Seeker Symposium: An Artistic and Political Platform Opposing Oppression by Mark Roberts. Bookmark the permalink.